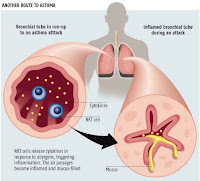 Asthma is the common chronic inflammatory disease of the airways characterized by variable and recurring symptoms, reversible airflow obstruction, and bronchospasm. Symptoms include wheezing, coughing, chest tightness, and shortness of breath. Asthma is clinically classified according to the frequency of symptoms, forced expiratory volume in 1 second (FEV1), and peak expiratory flow rate. Asthma may also be classified as atopic (extrinsic) or non-atopic (intrinsic). Asthma is clinically classified according to the frequency of symptoms, forced expiratory volume in 1 second (FEV1), and peak expiratory flow rate. Asthma may also be classified as atopic (extrinsic) or non-atopic (intrinsic), based on whether symptoms are precipitated by allergens (atopic) or not (non-atopic). While asthma is classified based on severity, at the moment there is no clear method for classifying different subgroups of asthma beyond this system. Within the classifications described above, although the cases of asthma respond to the same treatment differs, thus it is clear that the cases within a classification have significant differences. Finding ways to identify subgroups that respond well to different types of treatments is a current critical goal of asthma research. Asthma was first recognized and named by Hippocrates circa 450 BC. During the 1930s–50s, asthma was considered as being one of the 'holy seven' psychosomatic illnesses. Its aetiology was considered to be psychological, with treatment often based on psychoanalysis and other 'talking cures'. As these psychoanalysts interpreted the asthmatic wheeze as the suppressed cry of the child for its mother, so they considered that the treatment of depression was especially important for individuals with asthma. among the first papers in modern medicine, is one that was published in 1873 and this paper tried to explain the pathophysiology of the disease. And one of the first papers discussing treatment of asthma was released in 1872, the author concluded in his paper that asthma can be cured by rubbing the chest with chloroform liniment. Among the first times researches referred to medical treatment was at the year 1880, where Dr. J. B. Berkart used IV method to administer doses of drug called Pilocarpin. In the year 1886, F.H. Bosworth FH suspected a connection between asthma and hay fever. Epinephrine was first referred to in the treatment of asthma in 1905, and for acute asthma in 1910. Although asthma is a chronic obstructive condition, it is not considered as a part of chronic obstructive pulmonary disease as this term refers specifically to combinations of disease that are irreversible such as bronchiectasis, chronic bronchitis, and emphysema. Unlike these diseases, the airway obstruction in asthma is usually reversible; however, if left untreated, the chronic inflammation of the lungs during asthma can become irreversible obstruction due to airway remodeling. In contrast to emphysema, asthma affects the bronchi, not the alveoli. Brittle asthma is a term used to describe two types of asthma, distinguishable by recurrent, severe attacks. Type 1 brittle asthma refers to disease with wide peak flow variability, despite intense medication. Type 2 brittle asthma describes background well-controlled asthma, with sudden severe exacerbations. An acute asthma exacerbation is commonly referred to as an asthma attack. The classic symptoms are shortness of breath, wheezing, and chest tightness. While these are the primary symptoms of asthma, some people present primarily with coughing, and in severe cases, air motion may be significantly impaired such that no wheezing is heard. Asthma as a result of (or worsened by) workplace exposures is a commonly reported occupational respiratory disease. Still most cases of occupational asthma are not reported or are not recognized as such. Estimates by the American Thoracic Society (2004) suggest that 15–23% of new-onset asthma cases in adults are work related. In one study monitoring workplace asthma by occupation, the highest percentage of cases occurred among operators, fabricators, and laborers (32.9%), followed by managerial and professional specialists (20.2%), and in technical, sales, and administrative support jobs (19.2%). Most cases were associated with the manufacturing (41.4%) and services (34.2%) industries. Animal proteins, enzymes, flour, natural rubber latex, and certain reactive chemicals are commonly associated with work-related asthma. When recognized, these hazards can be mitigated, dropping the risk of disease. Common symptoms of asthma include wheezing, shortness of breath, chest tightness and coughing. Symptoms are often worse at night or in the early morning, or in response to exercise or cold air. Some people with asthma only rarely experience symptoms, usually in response to triggers, whereas other may have marked persistent airflow obstruction. Asthma is caused by environmental and genetic factors. These factors influence how severe asthma is and how well it responds to medication. The interaction is complex and not fully understood. Studying the prevalence of asthma and related diseases such as eczema and hay fever have yielded important clues about some key risk factors. The strongest risk factor for developing asthma is a history of atopic disease; this increases one's risk of hay fever by up to 5x and the risk of asthma by 3-4x. In children between the ages of 3-14, a positive skin test for allergies and an increase in immunoglobulin E increases the chance of having asthma. In adults, the more allergens one reacts positively to in a skin test, the higher the odds of having asthma. The inconsistency of this data has inspired research into other facets of Western society and their impact upon the prevalence of asthma. One subject that appears to show a strong correlation is the development of asthma and obesity. In the United Kingdom and United States, the rise in asthma prevalence has echoed an almost epidemic rise in the prevalence of obesity. In Taiwan, symptoms of allergies and airway hyper-reactivity increased in correlation with each 20% increase in body-mass index. Several factors associated with obesity may play a role in the pathogenesis of asthma, including decreased respiratory function due to a buildup of adipose tissue (fat) and the fact that adipose tissue leads to a pro-inflammatory state, which has been associated with non-eosinophilic asthma. Asthma has been associated with Churg–Strauss syndrome, and individuals with immunologically mediated urticaria may also experience systemic symptoms with generalized urticaria, rhino-conjunctivitis, orolaryngeal and gastrointestinal symptoms, asthma, and, at worst, anaphylaxis. Additionally, adult-onset asthma has been associated with periocular xanthogranulomas. Many environmental risk factors have been associated with asthma development and morbidity in children. Maternal tobacco smoking during pregnancy and after delivery is associated with a greater risk of asthma-like symptoms, wheezing, and respiratory infections during childhood. Low air quality, from traffic pollution or high ozone levels, has been repeatedly associated with increased asthma morbidity and has a suggested association with asthma development that needs further research. Recent studies show a relationship between exposure to air pollutants (e.g. from traffic) and childhood asthma. This research finds that both the occurrence of the disease and exacerbation of childhood asthma are affected by outdoor air pollutants. High levels of endotoxin exposure may contribute to asthma risk. Viral respiratory infections are not only one of the leading triggers of an exacerbation but may increase one's risk of developing asthma especially in young children. Antibiotic use early in life has been linked to development of asthma in several examples; it is thought that antibiotics make children who are predisposed to atopic immune responses susceptible to development of asthma because they modify gut flora, and thus the immune system (as described by the hygiene hypothesis). The hygiene hypothesis (see below) is a hypothesis about the cause of asthma and other allergic disease, and is supported by epidemiologic data for asthma. All of these things may negatively affect exposure to beneficial bacteria and other immune system modulators that are important during development, and thus may cause an increased risk for asthma and allergy. Caesarean sections have been associated with asthma, possibly because of modifications to the immune system (as described by the hygiene hypothesis). Respiratory infections such as rhinovirus, Chlamydia pneumoniae and Bordetella pertussis are correlated with asthma exacerbations. Beta blocker medications such as metoprolol may trigger asthma in those who are susceptible. Observational studies have found that indoor exposure to volatile organic compounds (VOCs) may be one of the triggers of asthma, however experimental studies have not confirmed these observations. Even VOC exposure at low levels has been associated with an increase in the risk of pediatric asthma. Because there are so many VOCs in the air, measuring total VOC concentrations in the indoor environment may not represent the exposure of individual compounds. Exposure to VOCs is associated with an increase in the IL-4 producing Th2 cells and a reduction in IFN-γ producing Th1 cells. Thus the mechanism of action of VOC exposure may be allergic sensitization mediated by a Th2 cell phenotype. Different individual variations in discomfort, from no response to excessive response, were seen in one of the studies. These variations may be due to the development of tolerance during exposure. Another study has concluded that formaldehyde may cause asthma-like symptoms. Low VOC emitting materials should be used while doing repairs or renovations which decreases the symptoms related to asthma caused by VOCs and formaldehyde. In another study "the indoor concentration of aliphatic compounds (C8-C11), butanols, and 2,2,4-trimethyl 1,3-pentanediol diisobutyrate (TXIB) was significantly elevated in newly painted dwellings. The total indoor VOC was about 100 micrograms/m3 higher in dwellings painted in the last year". The author concluded that some VOCs may cause inflammatory reactions in the airways and may be the reason for asthmatic symptoms. There is a significant association between asthma-like symptoms (wheezing) among preschool children and the concentration of DEHP (pthalates) in indoor environment. DEHP (di-ethylhexyl phthalate) is a plasticizer that is commonly used in building material. The hydrolysis product of DEHP (di-ethylhexyl phthalate) is MEHP (Mono-ethylhexyl phthalate) which mimics the prostaglandins and thromboxanes in the airway leading to symptoms related to asthma. Another mechanism that has been studied regarding phthalates causation of asthma is that high phthalates level can "modulate the murine immune response to a coallergen". Asthma can develop in the adults who come in contact with heated PVC fumes. Two main type of phthalates, namely n-butyl benzyl phthalate (BBzP) and di(2-ethylhexyl) phthalate (DEHP), have been associated between the concentration of polyvinyl chloride (PVC) used as flooring and the dust concentrations. Water leakage were associated more with BBzP, and buildings construction were associated with high concentrations of DEHP. Asthma has been shown to have a relationship with plaster wall materials and wall-to wall carpeting. The onset of asthma was also related to the floor–leveling plaster at home. Therefore, it is important to understand the health aspect of these materials in the indoor surfaces. Many asthma patients, like those who suffer from other chronic disorders, use alternative treatments; surveys show that roughly 50% of asthma patients use some form of unconventional therapy. There is little data to support the effectiveness of most of these therapies. Evidence is insufficient to support the usage of Vitamin C. Acupuncture is not recommended for the treatment as there is insufficient evidence to support its use. Air ionisers show no evidence that they improve asthma symptoms or benefit lung function; this applied equally to positive and negative ion generators. Dust mite control measures, including air filtration, chemicals to kill mites, vacuuming, mattress covers and others methods had no effect on asthma symptoms. However, a review of 30 studies found that "bedding encasement might be an effective asthma treatment under some conditions" (when the patient is highly allergic to dust mite and the intervention reduces the dust mite exposure level from high levels to low levels). Washing laundry/rugs in hot water was also found to improve control of allergens. A study of "manual therapies" for asthma, including osteopathic, chiropractic, physiotherapeutic and respiratory therapeutic manoeuvres, found there is insufficient evidence to support their use in treating. The Buteyko breathing technique for controlling hyperventilation may result in a reduction in medications use however does not have any effect on lung function. Thus an expert panel felt that evidence was insufficient to support its use.